Seventeen-year-old twins, Andrew and Andrea Morris, have always been close. They share everything—from their friends to a room—and they both enjoy star positions on their high school’s soccer teams. All’s right with the twins...or is it? When new student Ryder Coltrane moves from Texas to their small New York town, he spins Andrew’s world upside down. All of Andrew’s past relationship troubles begin to make sense and his true feelings start to click into place after Ryder comes out to him. His friendship with Ryder turns secretively romantic, but secrets, they soon find out, are hard to keep. Once rumors start to fly, so-called friends turn on them, and the boys’ relationship turns into a bomb about to explode. But Andrew never expected it would be his own twin, Andrea, holding a lighter to ignite it. I love how this book covers what for some could be an uncomfortable but real subject matter. Regardless of one's beliefs or wishes when teenagers are discovering their sexuality some will discover that they are gay. Kudos to Ms. Lavoie for addressing this touchy subject head on. 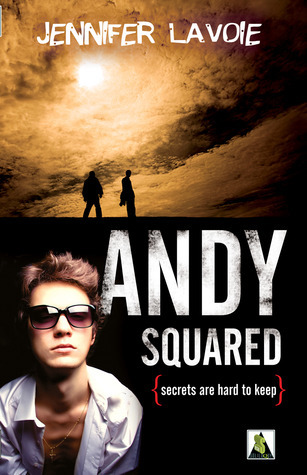 ANDY SQUARED is very much a character driven book and I do have to say that I liked the character of Andrew. The reader is given the opportunity to really get into his head as he learns to accept that he is gay. Ryder is just a dear as he is so patient with the time that Andrew needs to accept this aspect of himself. I found that all of the secondary characters just as well written including Andrew's sister Andrea who I felt really should have been taught that she doesn't always get her own way. I very much enjoyed ANDY SQUARED and read it in one sitting. I feel that it is a great book that is perfect for teenagers and adults who enjoy the young adult genre. I rate this book a 4.